Mother's Day is just around the corner, my friends! I find it ironic that what I would most like to do is spend the day alone on a tropical island with a Pina Colada in one hand and my Kindle in the other while someone else watches my kiddo. However, we already have an entirely unrelaxing day planned that includes two brunches and a dinner, so look for me to be collapsed in my bed in a fog of exhaustion by 7:30PM. Here's hoping I can at least catch a nap in the car between engagements. I know that many of you are hard at work today surfing the internet instead of doing whatever it is you're supposed to be doing inside your cubicle, so I've put together a short little Mother's Day Gift List to help you pick out something wonderful for the Mommies in your life. Remember, there is nothing she would rather do less than spend time with her children on Mother's Day, so please buy her something nice to make up for it. 1. 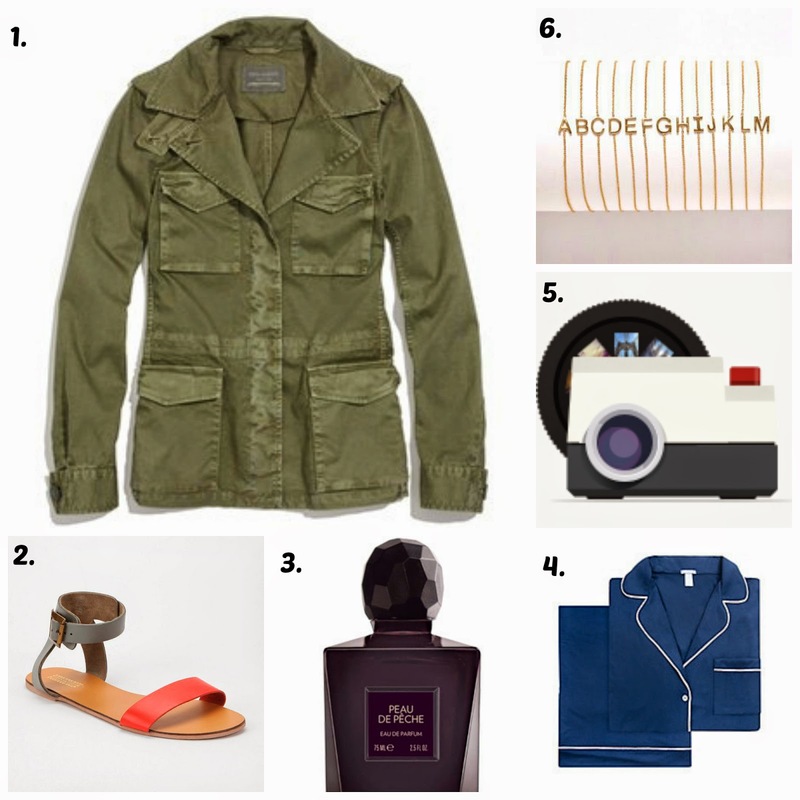 A chic Military Jacket is versatile for spring and has lots of pockets for holding kleenex and snacks. 2. The perfect summer sandals that only look expensive. 3. I wish there was such a thing as scratch-and-sniff blog, because this perfume is amazing (and it's my signature scent). 4. The best pajamas that almost makes up for Mom never getting enough sleep. 5. Turn Mom's favorite Instagram photos into a slideshow and bore the heck out of your childless friends!